New Short Story for Children written by: Rosa Maria Martin – Moreno Navarro. Mathew was a kid living in a small town beside small mountains. He liked to watch the sky every night, searching for the moon to watch it and admire it. Sometimes he looked at her so much that his eyes were hurting, and used to end up falling asleep on the edge of the window. – “Here Mathew I brought you a little moon”. Mathew really liked it, they did not have much money to buy toys, Mathew´s dad had lost his job four years ago. Mathew watched the sky every night to see his friend the moon, but he was scared on cloudy nights when he could not see the moon, and used to call his parents to ask them why could he not find it. 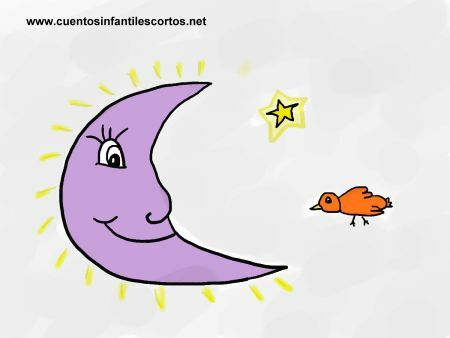 – “Mathew, don´t worry about your friend the moon, she is sleeping, she has to rest also to shine intensely”. Mathew was shocked, he finally understood why was the moon hiding sometimes. Summer passed and winter arrived, it was a hard winter, so hard that rained almost every night, and it was snowing sometimes. Mathew spent more than a month without seeing his friend the moon, he was so sad that became sick, so sick that there was no medicine to treat him.